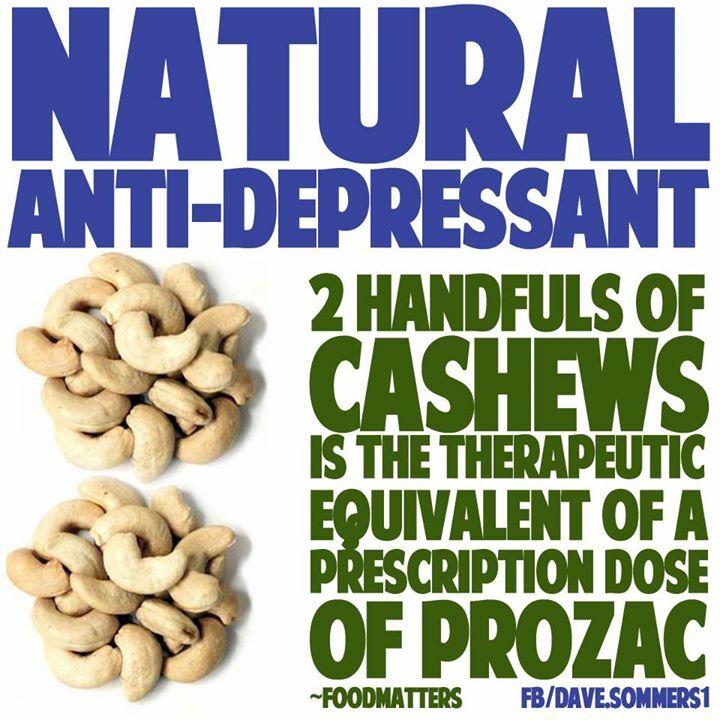 NATURAL ANTI-DEPRESSANT - 2 handfuls of cashews is the therapeutic equivalent of a prescription dose of Prozac. Inside you, the essential amino acid L-tryptophan is broken down into anxiety-reducing, snooze-inducing niacin. Even more important, tryptophan is also made into serotonin, one of your body's most important neurotransmitters. Serotonin gives a feeling of well-being and mellowness, or as the Australians would say, "no worries." This is such a profound effect that Prozac, Paxil and similar antidepressants usually either mimic serotonin or artificially keep the body's own serotonin levels high. You can do the same thing with your food. And no one can tell us that beans, peas, cheese, nuts and wheat germ are toxic if you eat a lot of them!